This weekend was probably the most impressive, since I have been in the USA. I competed in Terre Haute, unofficially called Cross Country Town USA, my first big college meet. The first heat included 41 Teams with 287 runner. But not the number of runners was impressive, rather it was the depth of the entire field making the event so exciting. 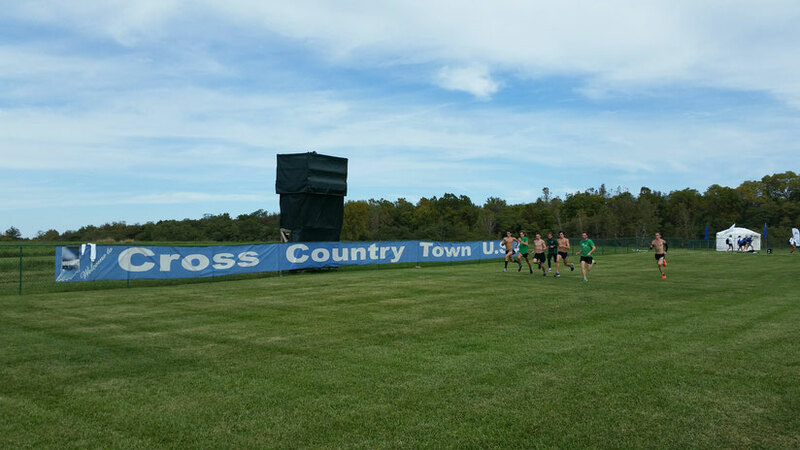 I am following the US-college-XC-scene for several years and knew this course already. To run now on that same course and to compete against such strong competitors was a big experience! Our team was lucky, to get an ideal starting box. We could sprint from the inside lane along the first 800m long start straight. Since the last training weeks didn't work as wished I had no reference how good my shape is. Because of that this race was the first test to see where I am at. My race plan was it to start fast and have a look what will happen. Although I took this goal a bit too serious. I ran the first kilometer in 2:50 and was in the top 40. The most part was downhill so I felt really comfortable with this pace and I tried to stay in this position on the next uphill session. After around three kilometers, I was a bit more on the limit as planned and many athletes started to pass me, During this situation, I tried to look forward and focus on the next downhill session where I could have a short breath. But as normally is, the downhill session was much faster than the other part. The good thing was, that there was just 2.5k to run and the finish line was much closer than before. At the next uphill section, I started to move forward a little bit and turned into the the endless home straight. There, I tried to over sprint as many runners as possible and finished finally in 131st position. It was very important to me, to see how it feels to run in such a big field. To my surprise, the fight for positioning was much less intense as I was used to from the European races. So I rarely used my elbows or pushed some opponents away. The main reason for that could be the much wider course and the less sharp turns. As already mentioned was the depth of the field was the most impressive part on that race. After three kilometer of running there was just a five seconds gap between the 40th and 100st position! Even in the finish was everyone close together. If I only would have run 15 seconds faster, I would already finish in the top 100. The biggest problem in this race for me was the heat. Even though the temperature was just 65° F, running in the pack felt much hotter. Because of that I had to several times run into the wind to cool down a bit. Overall, I can be satisfied with that race. A 131st place finish was definitely not the position I was looking for in the beginning of the season, but after the last few weeks it was a good start. For me the main goal was it to gain experiences by running with the best US college cross country runners, which allows me to be much more calm in the next big race.